The Housing Choice Voucher Program kicks off the 2019 CMHA U season with Housing Mediation Services. 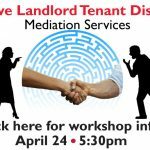 Do you need help resolving landlord tenant disputes? Housing Mediation Services offers help for property owners, managers and residents having disagreements regarding housing situations. The service is Free. Registration is now open, click here to sign-up.